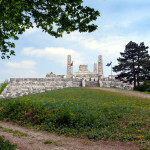 The monumental structure on Bradlo Hill was designed by the architect D Jurkovič and built from the Spiš-originated travertine. It was completed on the occasion of the 10th anniversary of the tragic death of this outstanding Slovak politician and statesman. A native of nearby Košariská, he has been credited with having made major contributions to the formation of Czechoslovakia on the ruins of the Austro-Hungarian Monarchy. However, his efforts for the furtherance of an equal position for Slovakia in the newly-formed republic never materialised. Moreover, the hitherto insufficiently clarified circumstances of his tragic death on his return to the new home country in the capacity of Minister of War left room for various legends to be born. His bitter fate is also reflected in Štefánik’s posthumous monument that was ignored by official circles of the totalitarian regime, with the exception of a brief period during 1968, in respect of which deliberate actions of disobedience were tolerated.